I use porcelain or cement wire-wound resistors, 10 watt variety with a high wattage. You may want to try 10, 20 and 30 ohm versions, not sure brands make much of a difference. . . . Mine came with 3, 6, and 10 ohm 5w wirewounds as choices. I use 2.7 ohm mundorfs (they do not have 3 ohm). They sound smoother and more solid than Wirewounds. Got my speaker back yesterday. The pair are going back into "breakin' mode in my second system as it turns out one of the drivers had to be replaced. I'll see how long I can resist putting them back in my main system. My original pair are just blowing me away lately so no real need to hurry! Will, you're not using sandcast right? You're using the metal oxide? Sorry Lon. I am using 20 w M-Resist Supremes. I got 2R7 and 3R3. They need breakin time....surprised? Research at the time led me to them, but can't remember details. They were worth it to me though over the original boxy ceramic sandcast ones...bigger, more solid and fluid/less tinselly if I recall. Preferring the 3R Wirewounds Bob sent, I used the 3R3 Mundorfs at first, but then ended up with the 2.7s. Subtle differences between but real. I even experimented with straight copper (no resistor) just caps with various combined values within roughly 10 percent of the original 3.3, and had nice results. Seems there is a nice margin of sound flexibility from using different caps; cap combinations adding up to the value you want, and different resistor types and resistances. Mine now is: A 2R7 Mundorf Supreme resistor followed by a Mundorf Supreme 3.3 cap parallel with a .047 K40Y-9 PIO, equaling a slightly higher value of 3.347 uf (over 3.3 Clarities). With the .047 they sound a little more refined with micro info, I guess due to the little cap refining the areas it allows through. Then there is a .1 K40Y-9 bypassing the above, going direct from the hot speaker post to the tweeter hot, enhancing the very highs a bit. I just tried running the 3R3s and 2R7s in parallel (presumably = 6R) and the top was receded/quieter. Too quiet for me, but very good sound and quite similar tweeter tone. Then I tried the 3R3 alone, and the highs came forward. The tweeter is a little quieter than with the 2R7s, but in a sense it sounded brighter/thinner than with the 2R7s alone. I am thinking that with the .1 PIO totally bypassing the rest, by lowering the volume of the main caps a little with the 3R3 resistor, the balance shifted high, the bypass cap now being a little more dominant in this mix. So I took out the .1 bypass and the balance is good again. The tweeter less powerful in the whole mix, and sounds great. A little softer, but very nice. This combo is: Mundorf Supreme 3.3 + K40Y-9 .047 with a 3R3 Mundorf Supreme Resistor before the caps. Now back to the 2R7 resistor followed by the Mundorf 3.3 parallel with the .047 K40Y-9, and with the .1 bypass back in, I still prefer this arrangement, here anyway. The top is textured, open and detailed, but beautifully smooth. In this system, it just sounds more natural this way with my MIII and with my MKIV. It is interesting how less treble can sound brighter and more brittle if the balance of high information is not just right. So technically I have just a bit more treble info than the original HR-1, but it is very well balanced with my system, and it enhances the rest of the sonic range beautifully...I guess it is mostly attack and decay info that does this, but wow, it just makes the voices and instruments more complete, realer. This is not to say this setup would be best for everyone...my HR-1s are tweaked in more ways than this, and then there is the system and room thing, but it has been a revealing exploration making these really great speakers greater to me. All that said, just changing the resistors will only introduce the qualities of that particular resistor and effect tweeter volume with different resistances. If I recall, I the smoothness of the Mundorf M-resists (and their caps), made things seem less bright. So if anyone explores these resistors, it may be a better bet to do as I ended up. If you like 3R Wirewounds, I might try a 2R7 with the Mundorfs. Or if you like a 6 Wirewound, maybe try a 5.6 M-Resist. Wow. I'm not sure I could go through that odyssey. I scale the tweeters way back, I just can't handle all that treble. I roll the tone control back on any guitar amp as well. And as I dial the tweeter back so much I'm not sure that I will actually see much benefit from different types of resistors. But I may try. Ah it was over a few months of messing around. What size resistor do you like? And is it the same on the new and the old pair? I've been using a 50 to 100 ohm on the original pair, swapping them in and out every few months or so and adjusting with the treble cut circuit. I think the 100 stay in more often than not believe it or not. So far I haven't used any on the new pair. . . they were just briefly in the main system, i was going to start experimenting along those lines when I discovered one speaker was distorting and sent it back. Reply #50 - Yesterday at 03:48:41 I use porcelain or cement wire-wound resistors, 10 watt variety with a high wattage. You may want to try 10, 20 and 30 ohm versions, not sure brands make much of a difference. . . Reply #51 - Yesterday at 04:03:46 Mine came with 3, 6, and 10 ohm 5w wirewounds as choices. I use 2.7 ohm mundorfs (they do not have 3 ohm). They sound smoother and more solid than Wirewounds. Well will, I ended up going to the resistor odyssey to get to that elusive "last five percent" some of us (most of us on this board it seems!) seek out of our systems. I spent some time with the 56 ohm Mundorf metal oxide resistors in place in the HR-1 which I really do like, a lot. Smoothed out what was going to the tweeters in a very appealing way, and added a rich vibrancy to the sound. I used these on the ERRs at my parents as well, in tandem with installing Mundorf Supreme caps. Wow. Perfect there, done stop don't mess with it good. But. . . a little too much reduction of treble energy in the main system, which surprised me, but with the edge those tweeters can give off tamed with the resistor I wanted more and it seems a sort of presence that is independent of the treble controls. So after referring to this thread a few times I decided to try the Mundorf M-Resist Supreme, 20 watt 33 ohm. At first I was "oh no what have I done as it was not at all great, but a few days later it's a great choice, gives me all the energy I need and the sound is so pure. . . but also full and rich. . . sort of what I feel is the sound of the Torii coming through unfutzed. So thanks for sharing your journey will, it has helped me inch even closer to having the Torii be the amp I want it to be for my recordings. Great news Lon. I am glad you got closer! It is interesting that you could go from 56 Mundorf metal oxide to 33 ohms with the M-Resist Supreme and not have that top edge you can't handle. The 20 watt M-resists really are nice, and this seems to be a tribute to that. More to come with more hours! Balanced detail is becoming more and more a thing for me. Like I spoke to in an earlier post here....where if the combination of resistor size, caps and bypasses was not just right, a technically less bright setup can sound brighter. But if I consider it carefully, this makes sense. If the micro information is not complete, the top will be edgy. Whereas, if letting more micro detail through balances the top information, it fills out the detail by providing more textured highs, finally softening edges. I know the thought of EQ makes your skin crawl, but I have proven this theory with it many times, where the sound seems a little bright in a rigid/edgy way, and I add 1/3 Db at something like 10.5-11KHz high shelf, and there goes the edge..Sweeter highs. Very small bypasses (like .047uf or .1) using fluid caps like the K40Y-9s are really a good tool for this that costs little if you ever get in the mood to try to get a little more. How many hours does it take to properly burn-in these Mundorf M-Resist Supreme resistors? I found a couple of weeks of use made a difference, and further seasoning made subtler improvements. my first post here. I am really interested in HR-1 speakers. There is a bit of confusion with all those mods with resistors and capacitors. Aren't the speakers setup well by default? Does this work for bi-wiring too or only if the speakers are bi-amped? If I understood well, these speakers have a passive radiator at the bottom. Can someone explain the character of bass in room when using a passive radiator, please? What I am aiming at is the fact I really dislike to boominess in the room and was leaning towards open baffle speakers so not sure how these would behave in a 13x20' room. Should behave well and you shouldn't have boominess imo unless you have an amp that doesn't well control the lower frequencies and or room issues that lean that way. Yes, the amp is well set up from the factory. I believe the current model uses different caps than the earliest in part because users requested and or installed different ones that yielded improvements. Resistors are a personal tailoring thing, they control the output of the tweeter and this can be a good tuning tool to suit the needs of the listener and the listening space. I don't believe that these speakers can be bi-amped or bi-wired but I'm not positive. . . . I love mine. I have no desire to change speakers, these have been my dream speakers in a way. I find the bass to be very tight and focused. Any boominess went away when I put my Hr-1s on isolation platforms which decoupled the floor structure. As for resistors, I played around with some but eventually took them out. They are a good tuning tool but not essential in my case. When Zigi built mine he put in capacitors that he felt were compatible with those in my ZMA. He did this on his own initiative but it wouldn't hurt to ask him about it. Like Lon, I am very happily attached to my HR-1s. Thanks for all the replies. These speakers are really tempting. I tried to get some "independent" info on other forums, but not so many users out there (at least not on that forum). Do you know if these speakers use GR Research M130 or perhaps M-130X for the mid range? They really look like one of these. I understand the best way is to listen to them, but I don't live close to IL. I wish I could find a review or two online. Why Decware doesn't send these for a review or at least invite someone to write one? Many of the audio magazines have "prerequisites" for equipment they review, which usually eliminates a small company from Decware from consideration, and Decware is not like those companies they do review. I believe that Decware had an unfortunate experience with a magazine early in the company's existence that may have dampened their enthusiasm for trying again. But then Tone Audio stepped in and they have done excellent reviews of several of the Decware products, so perhaps they will review the speakers at one day in the future. I took a leap of faith and bought a pair of these right before they hit production status. And then again three years ago bought a production pair. They are fantastic speakers. Surely worthy of a professional review and wider exposure. It makes sense what you wrote, thank you. Can you tell me more about HR-1, please? For example, the Radial driver is full range, so the speaker is omni, but not sure in which range. At what point the HF start to roll off there? Than, there are these two drivers up front. Is there any crossover there? I am trying to imagine what was done to depict myself what kind of sound one could expect. I also found in one Decware demo videos the speakers were set far in the room. Is this the optimal position or they would work 2,3 ft from the front wall as well and in the video the intention might have been to get the near field setup? There are those better able to answer this specifically than I (namely Bob and Steve) but I'll give you my impressions, free from technical details that I just don't know for certain. The 6" radial driver and the 6" midrange driver on the speaker front seem to cover about the same frequency range to me, but disperse the range differently of course. This, in tandem with the 4" ribbon tweeter and the plinth-loaded 8" driver give an eery sound. That's the first impression I had, and still remains at the core of my listening experiences. "Eery" in the sense that you are looking at a conventional type of speaker so it seems, and you are getting wonderful sound with elements of the conventional box tower speaker. . .but this sound is (when best set up and powered) near seamlessly integrated with a spacious enfolding sound the radial driver and 8" speaker are giving you. The net result is eery as it's as if you are both inside the music and "seeing" the instrumentation and moving air either before you or before you and around you. It's eery, and it's so in a good way. I get so used to it, and then get away from it for a while and then I'm drawn back in and the eeriness is renewed. I'm not sure where the cut-off point is for the tweeter. I find that I pad the output down quite a bit with a resistor in my room (which is a living room and totally untreated in any audiophile way). But the tweeter gives "directionality" in that it helps anchor image placement and supplement the liveliness of the other speakers with high frequency energy. I love the way these elements all fuse together. You can use the speakers two or three feet from the front wall. I prefer to have them out four or five feet. This aids the "envelopment in sound." But rooms are different and perhaps and especially in nearer-field listening closer to the front wall works really well for the spacial elements. Firstly, the front driver is a is GR Research M130. There is a crossover between the two front driver as well as a separate crossover for the radial driver. In the video the speaker are pulled out that far into the room because in that room that is where they sound best. Other than the corner horns, pretty much any speaker sounds good in that placement. This has more to do with having so many speakers in the same room at the same time. You would be fine 2-3' from the back wall. Not so much with open baffles I'd suspect. To clear up any confusion about the capacitors/resistors, in the early versions and much like early RL series of Decware speakers we installed the capacitor on the outside of the speakers. This is probably one of the most tweaked item in a speaker. The resistor on the outside is more for taming issues with lively rooms, as well as personal taste. On Will's pair of HR-Ones, he asked if I would mount his capacitor on the outside so he could play around with different brands, and construction materials. I obliged his request. In fact I've even used wire sent to me by the customer to wire up the drivers. 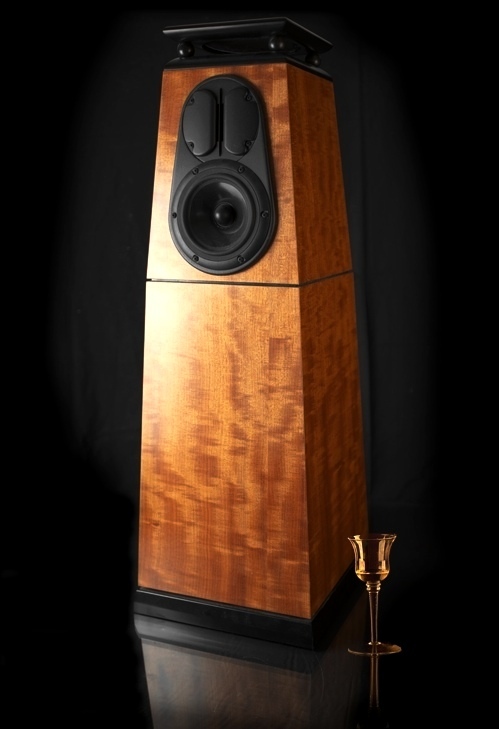 As far as reviews go...We once had a great review of the RL-3 speaker which was the precursor to the HR-Ones. In fact the reviewer even ordered a custom pair of RL-3's. Sales up to that point had been brisk, to say the least. After the review, sales dropped like a lead balloon. Coincidence, maybe, but you have to wonder if reviews have any weight in someone making up there mind.